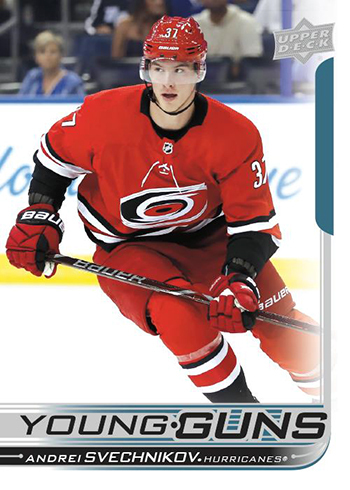 The 2018-19 Upper Deck Series 2 Young Guns have been revealed. The announcement came at Upper Deck’s Diamond Dealer Conference where they also confirmed autograph deals with Jack Eichel and Nico Hischier. Keeping with tradition, the set has another 49 Rookie Cards plus a checklist. Highlights include Andrei Svechnikov, Casey Mittelstadt and Brady Tkachuk. Like Series 1, the 2018-19 Upper Deck Series 2 Young Guns fall every fourth hobby pack. This makes them short prints but relatively attainable. 2018-19 Upper Deck Series 2 is scheduled to come out in mid-February.